In Icelandic waters the average size of male adults is 8,4 m and 7½-8½ tons, and females 8,4 m and 5,8-7 tons. Life expectancy is 40-60 years. The snout is narrow, the forehead is high and convex, and it contains whale oil, which was used for laxatives and salve. The front part of the lower jaw has one 2-4 cm long tooth on each side. The fluke is not indented and the colour is dark grey and the underside is somewhat lighter. The bottlenoses (Lat. Hyperoodon ampullatus) habituate the deep ocean areas between New York and the Mediterranean during winter and are spotted all the way south to Cape Verde and then migrate to the Arctic Ocean. They occur all around the country, but mostly between Iceland and Jan Mayen. Sometimes they follow the squid very close to the shore. More males than females have been observed in Icelandic waters, but the proportion is equal off Jan Mayen. Males reach the age of puberty at 9-11. 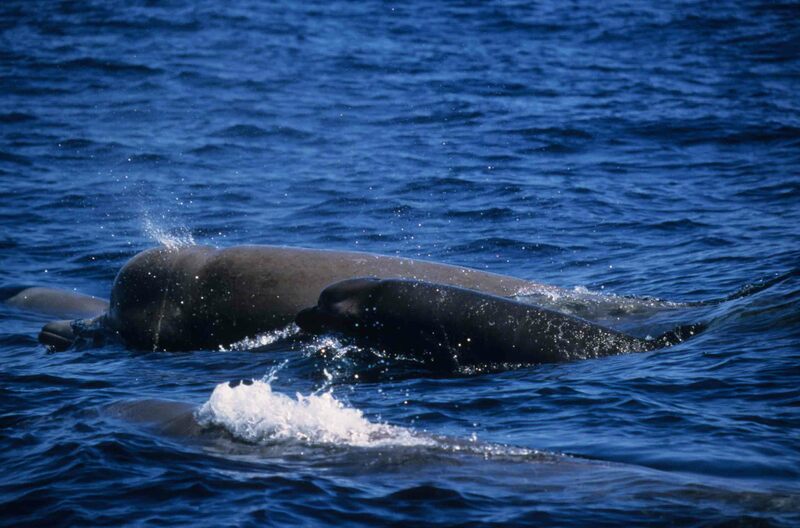 Mating takes place in April, the gestation period is one year, and the calf is 3 m long at birth. Pregnancy probably occurs every second year. The mainstay of the food is squid (Conatus fabricii and Ommatostrephes todarus). Bottlenoses are very sociable, but males are sometimes solitary. They dive down to 1000 metres and stay submerged up to 70 minutes. Once a harpooned bottlenose stayed submerged for two hours. The world population is unknown, but according to estimates, 42.000 animals should be in Icelandic waters.